The turmoil in the European bond market has demonstrated that the theory interest rates will not rise and are in control of central banks is dead wrong. Despite the ECB’s policy to buy in government debt to inject cash into the markets, one would think that the bonds would have a firm floor of support. The price action is starting to show that the Emperor has no clothes. Our Energy models clearly peaked in February both on the Weekly and Monthly levels. February was the highest monthly closing while intraday the high formed in April, but not on a sustainable level. The heavy losses in the Bunds are most significant for this was the market the European money was focused on assuming the Euro would break the holder would get Deutsche marks. The Euro is not going away easily because if it fails, tens of thousands of bureaucrats in Brussels will be out of work. Merkel wrong thinks Germany needs the Euro and is prepared to sacrifice her own country for a failed idea that should have stay as a simple trade/economic union rather than a political one. 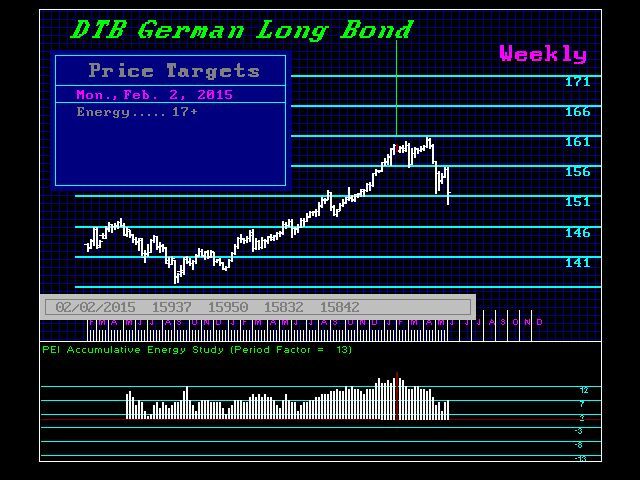 While the prices of government bonds dropped sharply sending yields upwards, the interest rate on German government bonds rose to just below the level of one percent. 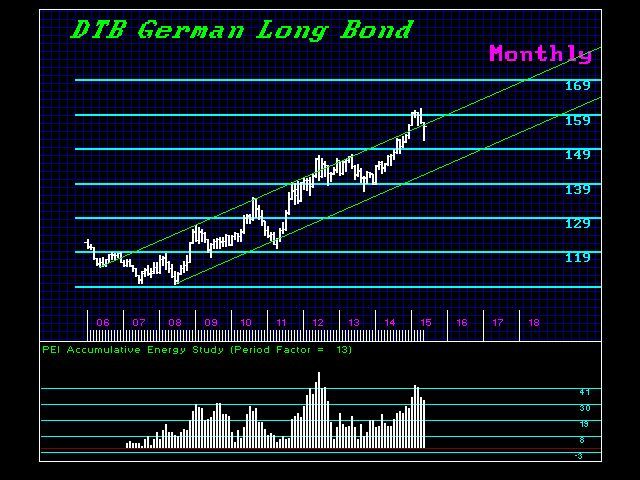 At the April high, the German ten-year government bonds were traded with a yield of almost zero percent. This was insane and clearly the peak in a bubble that suggested selling the bunds and buying 10 year US Treasuries would be a great trade. Some observers see the price falls as a result of controversial monetary policy of the ECB. In the fight against an assessment by the ECB to low inflation, the central bank had launched a number of measures. Most recently, the ECB in March bought a total of billion in government bonds. They made the April high. The ECB proudly thought they conquered the market achieving the desired objective of an inflation rate of just under two percent. Many assumed that with the ECB buying bonds, they shoud rally and that produced the April high. While many investors followed the ECB buying bonds, there was no one left to take the market higher. With everyone long, they only path was now clearly down. What is happening everywhere is that liquidity is drying up. It is this “lack of liquidity” that makes such extraordinary price movement possible. Mario Draghi on Wednesday had told investors after the last interest rate decision: “One lesson is that we must get used to periods of greater price fluctuations.” That was a clear statement that actually admitted his policy has failed. This is how Big Bang starts to unfold. This is the Bubble in Government and what we are seeing is the market place (free markets) will take interest rates higher even against the policies of the central banks. Government debt is uncontrollable from the central bank level. They do not create the debt, governments do that and there is no rational management concern within the political mechanism. Consequently, we have seen the peak in government both in markets as well as confidence. We may yet see the rush to the short-end in the classic flight to quality driving the short-term interest rates very negative as we move into October, but that should then be the final rally. What comes after will be interesting patterns that require the majority to be wrong for that is the fuel that propels the economy and markets. This may be the most difficult period to trade for many people. So no worries. The majority of people will never follow this site. The majority will read what they want to believe,never to try to challenge accepted beliefs like if the ECB is buying how can bonds decline. They will read the popular news sites, and listen to the talking heads of TV mainstream. Traditionally, they will lose their shirts and that will contribute to the rising civil unrest. It was like when they introduced Prohibition. They said outlawing booze would eliminate crime and make jails obsolete. That was up there with the sales pitch to sell the Euro – no more foreign exchange fees will make Europe boom.